Searching for the perfect Pareve Sugar Cookie recipe a few weeks ago, I found a bunch of references online to a now-defunct blog post (if you click the link, you will probably get a message telling you just how defunct) explaining how you could create your own sugar cookie mix in bulk. Intrigued, I tracked down an old cached copy of the post, with the recipe, and stashed it off-line for safekeeping. And yes, it uses shortening, and if you don’t want to use shortening, then don’t. Sometimes, you kind of have to. I use Butter-flavoured Crisco now that it’s pareve again here. Sugar Cookies for the YEAR! Warning: This makes a LOT of sugar cookie mix. In a LARGE bowl, combine the first 4 ingredients. Cut in shortening until mixture resembles fine crumbs. **This is your cookie base mix that you can freeze. I freeze 2 cups in Ziplock quart size freezer bags. On the bag, I write: “Add 1 egg and 1/2 teaspoon vanilla. Bake 375 for 8 minutes.” Really easy to just pull out of the freezer and a child can really make these easily on their own. I got 6 ziplock bags and 5 more batches that we made today. Combine the cookie base, egg and teaspoon vanilla extract. Using your hands, mix together to form a nice dough. Roll dough to 1/8 inch thick. Using cookie cutters, cut the dough and place on ungreased cookie sheet. Bake at 375° F for about 8 minutes or until a very light brown. Cool on wire rack. You can decorate with icing and sprinkles. Have fun! Makes about 2 dozen but depends on size of your cookie cutter shapes. If you don’t have cookie cutters, you can get creative and use the edge of a drinking glass and make nice round sugar cookies. Another Option is to use the dough to make Cherry - Almond Drops! Combine 2 cups cookie base mix, 1 egg, and 1/2 teaspoon Almond extract. Add 1/2 cup chopped almonds and 1/4 cup finely chopped maraschino cherries. Drop from teaspoon onto greased cookie sheet. Bake at 375° F for 8 - 10 minutes or just till edges are lightly browned. Cool on rack. Makes about 2 dozen. The only catch is that I decided to do it – for quickness’ and laziness’ sake – in my food processor. But even in a big food processor, I could only do half a batch at a time, and even then, it was VERY crowded and would barely mix properly. Anyway, a half-recipe made about 4 2-cup baggies for the freezer, plus one batch I made right away. Not exactly enough for a YEAR, but perhaps for a few months if you don’t overdo things. I made a batch of plain vanilla sugar cookies for Shabbos, cut out in loose magen david shapes and sprinkled with sugar, and they were quite well-received. I bake them a bit longer than the directions suggest, because we like them crunchy, almost brown but not quite. A food processor is not strictly necessary to mix up the frozen baggies of “cookie mix,” but I was in a hurry and didn’t want to either a) wait for the mix to thaw slightly or b) get my hands dirty (okay, I know – it’s not dirt, it’s FOOD; that’s what I tell my kids, anyway). For Shabbos, I just stirred it in a bowl, and that worked fine, too. It is a scary, dark blood-red colour – almost black – when it comes out, with a gel-like texture completely unlike any food colouring I’d ever known. Also, it’s not just colouring – it has a distinctive reddish velvety cake-ish flavour which you might or might not like. So there you have it… Red Velvet Cookies and your very own pareve freezer cookie mix. What I’d love is an oil-based sugar cookie recipe, but I suspect there’s no such thing. At some point, you really need that solid fat as a base. If you wanted to be totally decadent, you could probably mix up this same mixture using butter as the fat… but my food processor is pareve, so I’d have to do that by hand. And while I’m making dairy cookies by hand, I’d probably pull out the mixer and cream the butter with the sugar – the old-fashioned way. So… what’s your go-to pareve cookie recipe??? 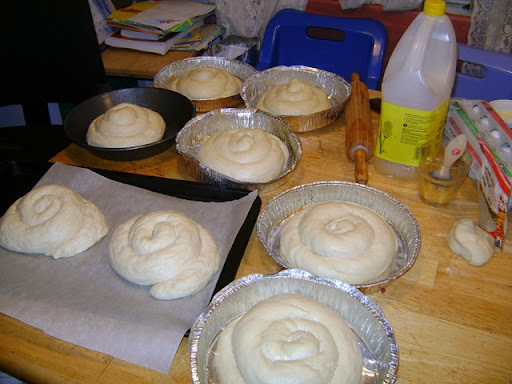 I bragged here over the summer about Elisheva’s challah-baking efforts while away from home. Well, over the last few years, it seems like she’s become the official birthday-cake baker for her circle of friends. Usually, she does something simple, but last night, inspiration struck and she made this Hobbit-themed cake, presumably from a friend who is kind of into The Hobbit. I continue to be intrigued by the concept of pumpkin challah, and I recently made a whole LOT of pumpkin mush. I posted about that on my regular blog, but saved these luscious pumpkin-challah pics for this blog, as a special treat for readers here. First of all, a fun discovery – you don’t need a shmancy recipe to get pumpkin challah! I actually just used the basic Artisan Bread in 5 Minutes a Day no-knead challah recipe, which I didn’t even love all that much. The pumpkin kicked it into far loftier spheres. Rather perfectly, this recipe called for 1 3/4 cups of water… for which I substituted about 1 3/4 – 2 cups of homemade frozen pumpkin purée, thawed. That’s it – that’s the trick. No water at ALL. If you’re using canned pumpkin, it might not work, because it’s very dry, but homemade frozen purée is a bit waterier and this worked out just fine. If you find that you can’t stir the mixture with your dough whisk, add a bit of water, maybe 1/4 cup at a time, until you achieve the proper consistency… it’ll still be delicious. This is a fairly wet dough that could really benefit from at least one stretch-and-fold operation, if not two, an hour or so before baking. Or you could make the dough ahead and refrigerate it. Or some combination of the two, to whip this unco-operative, slack dough into shape. And here they are, all risen, streuselled (the official Canadian spelling of “streuselled” has 2 l’s, I assure you), and ready to go! I added traditional pumpkin spice to the streusel – cinnamon, nutmeg, a tiny bit of clove. Okay, now – big l’havdil, but in traditional Japanese geisha culture, maiko, apprentice geisha, wear their hair in a “split peach” style, where a little bit of red fabric peeks out from their dense nest of black hair. That bit of red is supposed to be highly tantalizing, in a frankly sensual way. And THAT is exactly what the yellow of these finished challahs does for me. It calls out, inviting me, in the most tantalizing way, not just to eat, but to explore these challahs. I think – short of trying lurid things with food colouring, which has its place, for sure, especially for Parshas Noach! – this is the closest you’re going to get to a really intriguing contrast between interior and exterior colour. But now you know – it’s easier than you thought to make a totally fancy challah!